Today’s third Boosting the Signal catchup post features another pair of previous guests: the writing team of Jeffrey Cook and Katherine Perkins! They’re on hand to bring you an excerpt from Book 2 of their Fair Folk Chronicles–a series which, since this book’s release, has gone on to include a Book 3 as well! 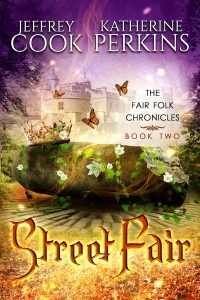 In this short excerpt from Street Fair, two characters have a very basic goal before them: figure out how to get past a barrier. Without exploding. As you do. After what seemed to Megan like an hour of slow, careful walking and occasionally squeezing through tree roots, they reached the first artificial support. The walls started showing fewer signs of encroaching roots, and the earth appeared more worked. “That bad?” Megan couldn’t help but ask. “Only if we cross this line,” Ashling pointed out an imaginary line on the floor, “Or mess with the ward the wrong way, or mess up with anti-magic, or maybe jump around too much, or breathe really hard in this direction.” Megan and Jude both drew back a little, careful to direct their breath elsewhere, in case. “So, we have two options. How do we get through?” Megan asked. “That’s a thing?” Megan knew she was going to regret asking, but had to know now. “What sort of equipment do they use for that?” After seeing the goblin market, Megan was trying to imagine what sort of tech or magic might be involved.